Shri Chitta Bhusan Dasgupta and Smt. 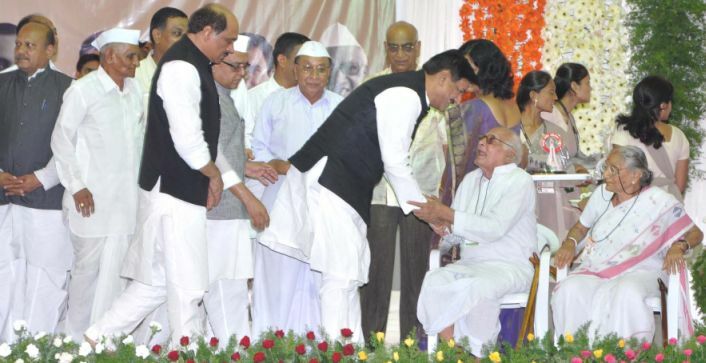 Malati Dasgupta were facilitated by the Honorable Chief Minister of Maharastra, Shri Prithwiraj Chauhan along with eight other ministers and the PCC Chief of Maharastra, Shri Manik Rao Thakre on 12th July, 2011 at Faizpur, Distt. Jalgaon, Maharastra on the eve of 75th anniversary of First Rural Congress held in 1936 at this place.